-Can’t imagine Lebron James losing to Boston after he’s owned them recently. On the other hand I can’t imagine again betting against Boston after I’ve sold them short all year and said I wouldn’t sell them short again. So either way I’m going to feel stupid if I make a pick in this series. -Will love to see if Brad Stevens can take the good from the Indiana series and the bad from the Toronto series and devise a game plan to stop the Cavs. It was a sin that Stevens didn’t get at least one vote from his peers for coach of the year. He is clearly the coach of the year this year after what he did after the loss of Gordon Hayward and Kyrie Irving. -The Celtics need to win game 1. You saw how much it took out of the Raptors when they had the game in their sights and let it slip away. They need to prove this is a different team than last year when they went out in five to the Cavs. -Who guards Lebron? Do they start with Marcus Smart? How much do they double team Lebron? Boston has many bodies to throw at Lebron. The Celtics were the top rated defense this year and they did a good job in the first two rounds against Giannis Antetokounmpo and Ben Simmons. -Does Boston’s youth finally show. Terry Rozier and Jaylen Brown have been stellar this year. Amazing they’ve been better in crunch time. Can the Celtics youth continue to shine when the light is the brightest? Prediction: As much as I’d love to bet Boston I can’t bet against Lebron and the Cavs that seem to be playing their best basketball now. Cavs in 6. -Even more important for Houston to get the first win in Game one of this series. The Rockets won 65 games in the regular season and it will all go out the window if they lose game 1. Interesting note only 20 teams have won 65 games in a season and 15 of them went on to win the title. – This series will be modern basketball at its finest. I can’t wait. Both teams spread the floor so well offensively. Both teams love to shoot the three. The drive and dish basketball will be on full display. Both teams love to play with such a fast pace. This is should a high scoring fun series to watch. We’ve been waiting all year for this series and I can’t wait. 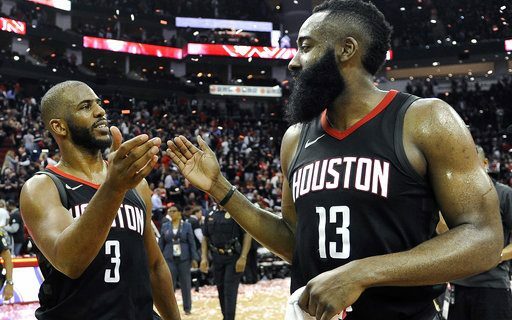 -Will the Rockets be able to exercise their demons? Chris Paul has finally made a conference finals but he still has so much to prove in this series for me. James Harden will win the MVP but he has a ton to prove in this series that he’s the best player in the NBA. Even Houston’s coach has much to prove in the playoffs. I love Mike D’Antoni but he like Harden and Paul he has much to prove in this series. -How will the referees call this series? As the playoffs go on it’s harder to get the nickel-dime calls that Harden has been getting in the regular season. Harden is so good at getting to the free throw line but can he get there at the same rate now? -The Warriors ability to switch with their versatile defenders will be a key. Klay Thompson maybe on Harden but he can switch with Green or Durant and not worry at all. This series will prove how good Klay Thompson is. If Thompson shuts down Harden then you can make the case he’s the best player on the team. -Rockets GM Daryl Morey has essentially been the Billy Beane of basketball when it comes to analytics. Will Morey’s team do what Beane’s A’s teams were never able to accomplish? -I love Clint Capela the Rockets center, but now he has to face Dremond Green. Capela is best around the rim. The Warriors are going to try to get him out on the perimeter and possible force him to switch and guard Durant or Thompson. This will be an interesting chess match-up. Prediction: This should be a classic. I can’t pick against the Warriors. The Warriors are playing their best ball with Curry healthy. This won’t be easy but I’ll take the Warriors in 7.